I have photos… lots and lots and lots of photos. I will post them as they are ready to be posted, please be patient with me and check the Gallery often. I plan on posting them to the Gallery as they are ready, it will take a while to get a written blog post edited and up about the trip. For now, here is one of my favorites. It is from our first day of travel in Scotland. I didn’t edit a thing! Scotland is that beautiful and we were that happy. Rarely do I dress them in “nice clothes” when we are at the cabin. The attire is old jeans and even older t-shirts. And the kids love it. They love the creek. They love throwing rocks in the lake. They love hiking in the muck. MUD!!! Beth is such a great sport. She is always willing to play with the kids and I know that the kids will always have fun memories of Beth and their childhood. This is a perfect example of what a creek hike looks like. I love that no one is looking except Lucy. And in case you were wondering, these photos do come at a cost. I ruined a perfectly good pair of white socks when I stepped into a hole that made the water go to my knees. more photos of messy kids here. My kids are lucky. One set of Grandparents has wide open fields, creeks to splash in, rocks to throw, and 4 wheelers to drive. Their other set of Grandparents have awesome parks right near their house and an indoor pool. Tim and I count our blessings because the kids had just as much fun spending a week at each set of Grandparents as they did at Disney World. This makes vacations on a budget a breeze when all we have to do is gas up the van, drive to the grandparents and then spend a week eating all their food and playing with all their toys! 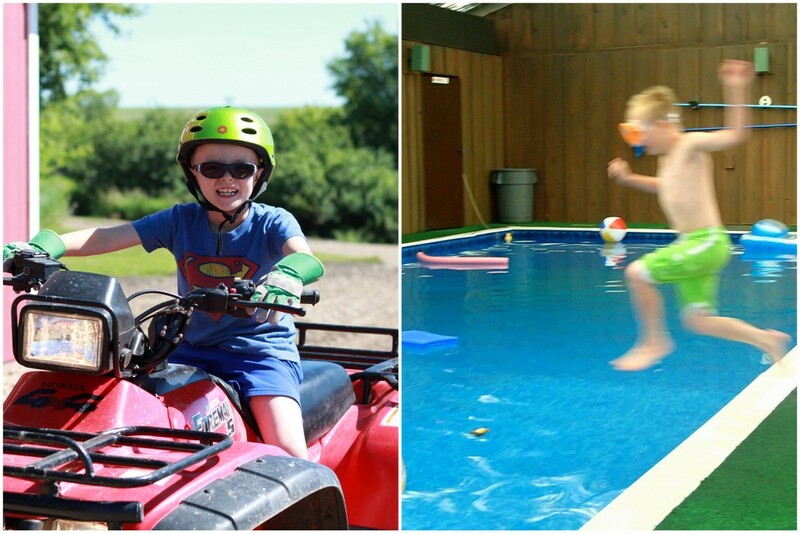 Today’s photo favorites are from swimming at Grandma and Grandpa Shannons. They are all taken with my little blue camera. Some are okay photos but most are out of focus, but do such a great job capturing the kids’ joy that I don’t care if they are not great photos. I think my favorite part of the entire trip was spending some one on one time with MIchael in the pool. He has come so far in his swimming that when he asked if I would teach him how to dive, I said yes. Diving is a scary thing if you don’t know how to do it. Kids can snap their neck so easily if they don’t learn how to dive shallow, so teaching how to dive was not taken lightly and Michael knew that. He worked really hard, and I regret not having a photo but I was too busy diving with him. He did so well and was so proud of himself. It was a great day. The water was really cold. They were in the process of installing a new heater while we were there but the 68 degree water temps didn’t keep us from having fun we just had to take breaks to warm up every once in a while! Everything became infinitely more fun when the cousins arrived. Something happened in the last 6 months since Christmas time. The age gap between Elise and Zeke shrunk and they became really good friends. It was fun to see and I think Elise was so relieved to have someone closer to her size to play with. And of course an obligatory shot of Elise and her ruffled bum. many many more photos here.